With apologies to distance runners, I imagine that roaming the maze that is an IKEA showroom floor is much like doing a marathon, only more torturous. 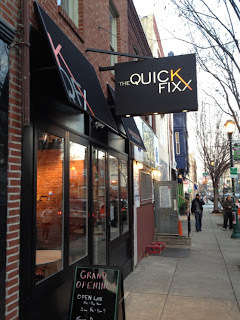 It helps to load up on carbs in both cases, which is why we stopped at The QUICK FIXX on South Street last weekend before shopping for a bunch of Swedish-designed home goods like the Klappsta, the Klippan, and the Klobo. The QUICK FIXX (1511 South St., 267-273-1066), which opened the first week of January, serves made-to-order “chef-inspired cuisine at takeout pricing,” as proudly stated on the restaurant’s website. The concept is the brainchild of Matt Levinson, who cut his teeth in hospitality management at A.C.’s Borgata. The eatery offers neighborhood delivery and take-out, but can also seat as many as 16 diners. The attractive interior brick décor and chalkboard menu hanging behind the counter wouldn't be out of place at a restaurant in Manhattan's trendy Meatpacking District. 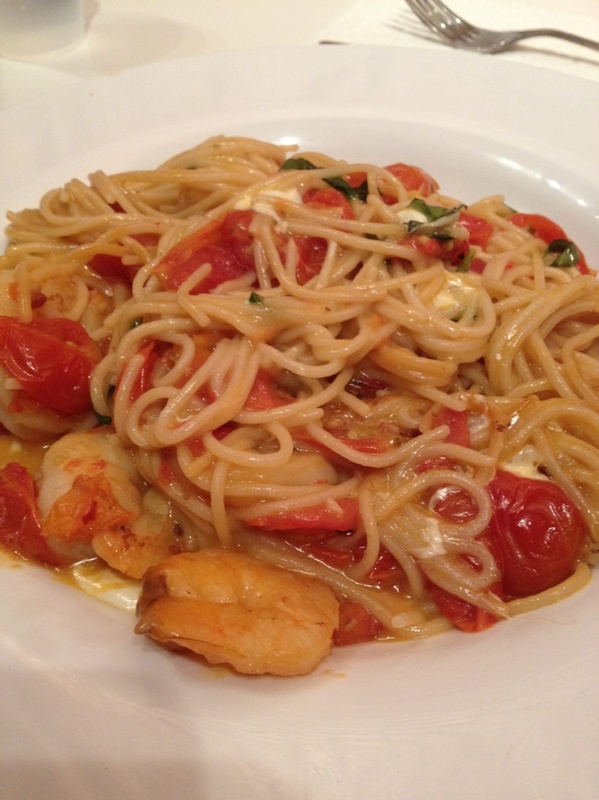 While the menu is limited by design primarily to pastas, salads and (non-gluten-free) flatbreads, the options are not. 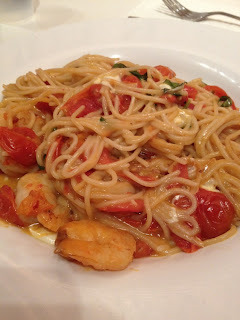 Our older son went with the Pasta Fresca from the Chef's Signatures section of the menu ($8), opting for the gluten-free spaghetti tossed in a spicy tomato sauce with a sauteed shrimp add-on ($4 extra), and mixed with cherry tomatoes, diced mozzarella, fresh basil, garlic and oil. I was intrigued by the Smoky Roman (pasta with cream sauce, smoked bacon, lemon zest and cheese) ($11), but was plenty pleased with the Build-Your-Own gluten-free penne dish ($7), cooked perfectly - not al dente, not mushy. (Gluten-free ravioli also is available.) The pasta was dressed with a tangy tomato gravy (one of many safe sauces) and grilled chicken ($3 extra). Levinson, who has designs on other locations, is in the process of updating The QUICK FIXX’s printed menus to note every item that’s gluten free. The kitchen, with Charles Reinhardt at the helm, takes precautions in preparing the gluten-free orders separately to avoid cross-contamination.